Vanguard's headquarters are located in Guangdong, China and was founded in 1986. Since then they have grow from small beginnings of a single manufacturing facility in Asia to a truly global corporation. With headquarters in Guangdong, China, they are represented all over the United States, many countries in Europe as well as China and Japan. Their main sales and administrative branches are located in Whitmore Lake, Michigan USA, Luxembourg, Europe and Tokyo, Japan and as such their binoculars are available in both the US and the UK. Initially Vanguard specialized in photo and video accessories like lens cleaning kits and now apart from the large range of binoculars, monoculars and spotting scopes, they also manufacture positioning equipment like tripods, monopods, gun pods, shooting sticks and TV mounts. They also produce photo-video bags, tool cases, hunting cases (archery and gun cases), computer cases, and universal cases. 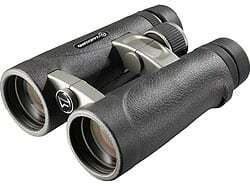 Whilst true to say Vanguard are not the most widely known optical brand, they have earned a solid reputation for producing quality binoculars combining innovative features, functionality and reliability with good value for money. 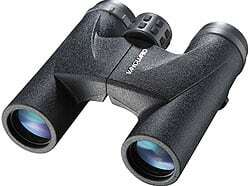 Vanguard have a wide range of binoculars in their range in both roof and porro prism designs. From the excellent top of the range Endeavor ED binoculars that feature their extra low-dispersion, ED glass to the Vanguard Ocean and Mariner series that are specially designed for water sports, boating as well as general marine observation. 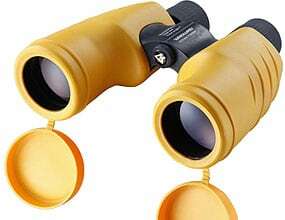 Compact binoculars are well catered for with their DA, DR, SDT and NDT Series of binoculars, with some designed for the outdoors and others ideal for viewing operas or in the theater. Like them or not, Zoom binoculars are also available in their ZF range. 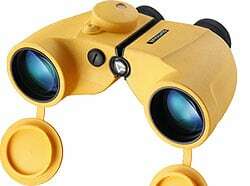 Most binoculars come in black, but some models are available in camo print especially for hunting and bright yellow versions for marine use. The top of the range full size Vanguard Endeavor ED roof prism binoculars come in 8.5x45 and 10.5x45 as well as more standard 8x42 and 10x42 configurations and all feature their premium extra low-dispersion ED glass which reduces color dispersion and is said to offer you sharpness and clarity like never before with exceptional light transmission and remarkable color resolution and contrast. All Endeavor ED models are Nitrogen-charged and O-ring sealed, making them both waterproof and fogproof. They have a wide view angle, BaK4 roof prisms, an anti-reflection coatings, large focus adjustment wheel and long eye relief. They have a good looking contemporary open-bridge design that not only looks good, but is ergonomic, giving you a good grip and making them very comfortable to use. New - The series of Vanguard Endeavor ED II binoculars was first announced at the Shot Show in 2014 and should be available in spring 2014 according to sources that I have spoke to within the company. You can read full details of the New Vanguard Endeavor ED II Binoculars here, or read my full review of the 8x42 Endeavor ED II here. Designed to take over from the "standard" Endeavor ED's above these will become Vanguard's new flagship binoculars. The biggest improvement is upgrade to the quality of the ED glass in the lenses, with these new versions using HOYA ED glass made in Japan that Vanguard says gives improved overall optical performance with better light transmission when compared to their previous Endeavor binoculars..
As you would expect wit a bin in this class, all Endeavor ED models are filled with dry Nitrogen gas and fully sealed making them both fog and waterproof. Like the top of the range Endeavor ED binoculars the new Spirit ED binoculars feature their premium extra low-dispersion ED glass prevents chromatic aberration and is said to offer you sharpness and clarity like never before with exceptional light transmission and remarkable color resolution and contrast. There are three models in this series all of which are water as well as for proof and as well as ED glass feature a whole host of high quality optical components and coatings. These include phase coated Bak-4 prisms, and fully multi-coated lens elements to produce an impressive light transmission of up to 90 percent that according to Vanguard results in a near-perfect viewing experience. 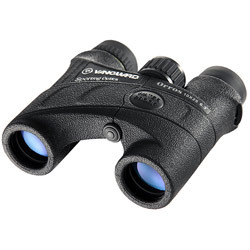 Spirit ED binoculars also come with a lightweight, comfortable-to-hold body design, twist-out eyecups for long eye relief and a large focus adjustment wheel. Depending on the model, they are available for around $300 (£280 - £300) and as such they are competing with other very popular binoculars like the Nikon 8x42 Monarch ATB Binoculars (view and compare all Mid Priced Binoculars that I have reviewed). But if you take into consideration that these come with ED glass and other top features, In my opinion they make excellent value for money. Loosely based on their top of the range Endeavor ED Binoculars, the Spirit XF has a number of their user-friendly and high end features, but all at a budget-friendly price. What is instantly noticeable is their distinctive open-bridge design, which is ergonomic and helps to keep the weight down. The textured rubber armoring looks great and helps to protect the internal optics. The body is waterproof and the barrels have been filled with nitrogen gas to inhibit internal fogging. 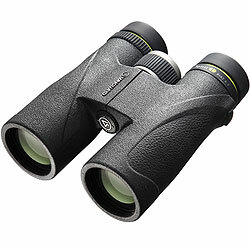 These Vanguard Spirit XF binoculars come with fully multi-coated lenses and BaK-4 roof prisms which help to optimize light transmission and therefore produce bright images even when the available light is poor. The prisms also have Vanguard's P2 Phase coating added to them, these phase correction coatings help to keep the light in correct color phases with the result of producing clearer images and better color reproduction. An emerald coating has also been added to the lenses, which Vanguard say is specifically designed to provide the full spectrum of color within the band of green tones which they say is ideal for outdoor nature enthusiasts because it ensures the most vivid and natural shades of green. The Spirit XF comes with a Carry Case, Neck Strap, lens covers and Vanguard also provides a Premium Lifetime Warranty on both their Spirit XF binoculars. Taking a look at their main optical and physical features, the low cost Orros series looks like they punch well above their price tag. All five configurations come with high end BaK-4 roof prisms and multi coated optics that are protected in a rubber armored fog and waterproof body. Also keep an eye out for the two compact models that also feature a unique offset hinge and focus wheel that helps them fold up into a more compact shape than other roof prism compacts with a single centrally located hinge. It also makes reaching the focus wheel more comfortable and less fiddly if you have larger hands by using your right hand. Whilst if you have small hands, it is closer to reach with your left hand which is perfect for women and older children. I would probably describe the Endeavor series as Vanguard's workhorse series because these binoculars have everything to get the job done and to get it done well. These roof prism binoculars come in a wide range of configurations, from the fairly compact 8x32mm that is available in a black and camo exterior, to the full size 10x and 8x42mm Endeavor's to the large 10x50 Endeavor and it's superior light-gathering configuration. All have fully multi-coated lenses and use what Vanguard say is an "advanced optical system combined with outstanding lens coatings creating superior light-gathering abilities." What ever the case on the whole they do produce excellent quality images that are both bright and sharp and one coating that is worth a special mention is an anti-reflection coating that helps minimizes light reflection keeping the light focused to where is should be for "crisper images". Quality BaK-4 prisms are used throughout the series and all the Endeavor binoculars are both waterproof and fogproof. Well balanced and comfortable to hold they all come with a rubber armor that feels secure in your hands and helps protect your optics from day to day knocks and bumps. Other features of this series include an easy to adjust click diopter ring and even though I am usually not a fan of twist out eyecups, I did like the 3-stage locking eyecups that makes adjusting them simple and keeps them at the setting that you like. 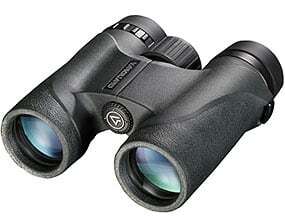 The SDT compact range consists of two high quality compact roof prism binoculars. Bak 4 prisms and fully multi-coated lenses ensure an excellent quality and bright image (for their size) is produced. 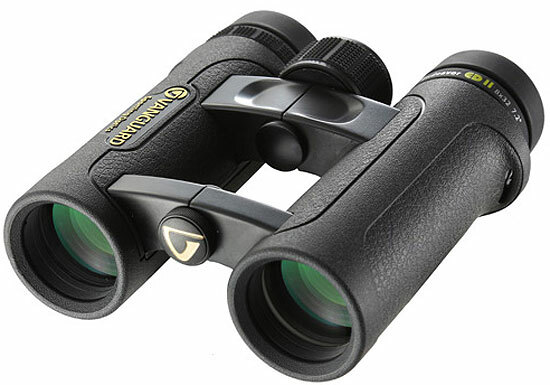 The body is made of solid magnesium alloy, that have been encased in a durable textured armor, that ensures that these SDT binoculars are compact, lightweight and durable. The twist out eyecups ensure that there is plenty of eye relief (18mm on the 10x version). Another indicator of their attention to detail and quality is that they are Nitrogen-charged and 0-ring sealed, making the Vanguard SDT binoculars 100% waterproof (up to one meter/3.3 feet ) and fogproof and come with a limited lifetime warranty. The most important features of any Marine Binocular is to be waterproof and as stable as possible for looking through in an unstable boat. The Vanguard Mariner ensures that you are well looked after in both these departments. They are 100% waterproof up to 16 feet/5 meters as well as fogproof and come with a floating neck strap that keeps the binocular on the surface of the water should you accidentally drop them overboard. The bright yellow non-slip rubber armor not only protects them, but helps with the handling and grip in cold or wet weather. The 7x magnification is strong enough to view distant objects but not too powerful, which would make keeping a stable view through them impossible on rough or choppy waters. A porro prism design, the Mariner's have fully multi-coated lenses with BaK4 prisms that are made with a higher quality glass (barium crown) that helps produce brighter images and high edge-to-edge sharpness with excellent light transmission. 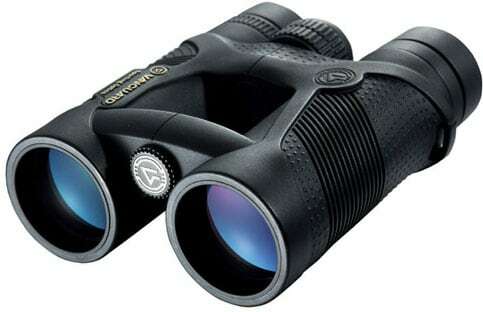 The large objective lenses also make this binocular a great choice for low light situations. Other features include an internal reticle illuminator and compass, and an Individual Focusing System allows for simultaneous adjustment and focusing when using the diopter scale. Other than the fact that the Vanguard Ocean binoculars do not come with the internal reticle illuminator and compass, they are very similar to the Mariner's above. This makes them cheaper, but still come with the high quality lenses and construction of the Mariner's. The body is nitrogen-charged and O-ring sealed which means they are 100% waterproof and fogproof and they also come with a floating neck strap that keeps the binocular on the surface of the water should you accidentally drop them overboard. Quality BaK4 porro prisms and fully multi-coated lenses ensure a clear image with excellent light transmission, this along with the large 50mm objective lenses mean that you get a really bright image even in poor light conditions. The bright yellow non-slip rubber armor not only protects them, but helps with the handling and grip in cold or wet weather. The strength in these mid range Vanguard Spirit roof prism binoculars is their versatility, they come in a whole range of configurations including a rather compact 8x36 available in both black and Vanguard's Mossy Oak® finish that makes an ideal compact hunting binocular. All Spirit binoculars are both waterproof and fogproof and come with high qualityBaK4 prisms and are fully multi-coated to ensure a excellent quality image is reproduced no matter the conditions. The Spirit binoculars are Vanguards best selling range and have been recommended by leading testing panels for their combination of technical features, design functionality and cost. Spirit is all about comfort with an unbelievable light weight, long eye relief and an ergonomic grip with thumb rest. Depending on which size you choose, they range in price from about $140 - $200 (£180 - £250) and as such they are competing with other very popular Mid priced binoculars like the Nikon 8x42 Monarch ATB Binoculars (view and compare all Mid Priced Binoculars that I have reviewed). 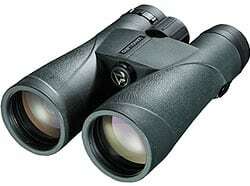 But overall these are great binoculars for the price and especially like the more compact 8x36's.